Last night I went crazy and made red meat, meaning I cooked steaks. In my house, the steak cooking is left to Bug because he has no faith in me to not mess it up. Not that I’m a bad cook, it’s just that I’m better at vegetarian stuff like quinoa and white meats like chicken and pork. Now, of course, my steak looked nothing like that. For starters, there was no bone and there were three of them. But I didn’t let that deter me. I heated up my grill pan, coated my steaks in fresh sea salt, covered the bottom of the pan with olive oil and seared the hell out of the bottom side. While the bottom was cooking, I tried to rub salt all over the top side, but kept getting splattered. Giving up on that, I flipped the steaks over after 4 minutes, put a glob of butter on each steak, and shoved it under the broiler for 5 minutes. Have I mentioned my fear of broiling? I’ve caught things on fire more than once back in my early twenties. Had to use a fire extinguisher and everything…good times. (And I still maintain, I am not a bad cook). Melt in your mouth, heavenly. That’s the best word to describe the steaks. By far the best thing I’ve cooked in ages. Added bonus: no one complained. Complete WIN. 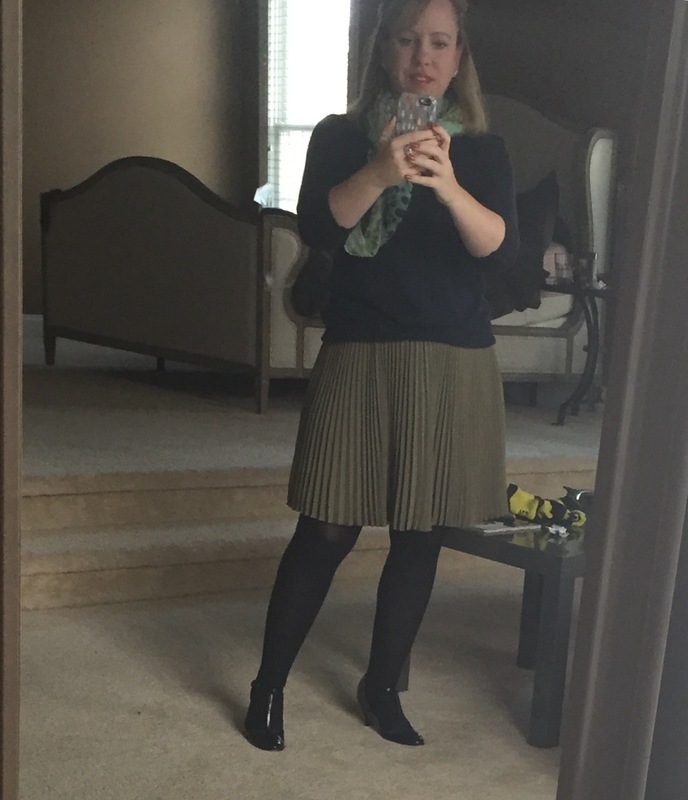 In other news, last weekend I picked up a Banana Republic skirt for about $13 after all the sales were added in. It’s a “summer” skirt, but I liked it, and I couldn’t say no to the price. 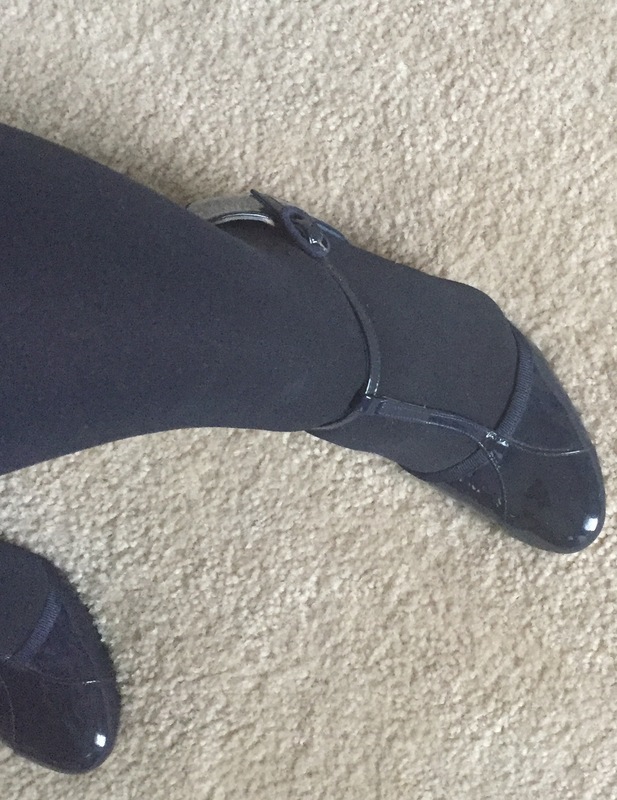 I needed to make it more appropriate for cool weather, so, taking inspiration from this site, I threw on a slouchy navy sweater, navy tights and t-strap heels, and my favorite peacock scarf. I think it works. May not be my poshist outfit, but it works for running around and keeping me warm. Oh! And I did the winged eyeliner again today. So much fun now that I know the trick. Here I am on Day 9 of My Pinterest Life, and I’ve learned a few things. First, I miss being domestic. When my life fell apart, I lost all interest in running my house, making dinners, and generally being crafty. This silly experiment has shown me how much I love and miss those things. Second, and I don’t talk about it a lot here, but yoga plays a huge role in my life. I do it almost every day for at least an hour. Nothing beats detoxing your mind and body. As for My Pinterest Life, tomorrow I’m going to work on organizing the linen closet. Should be a riot. Annnnnd I just got a call the Colonel has puked at school, this is after a call earlier about Pudge and his headache. Good thing I have yoga tonight!